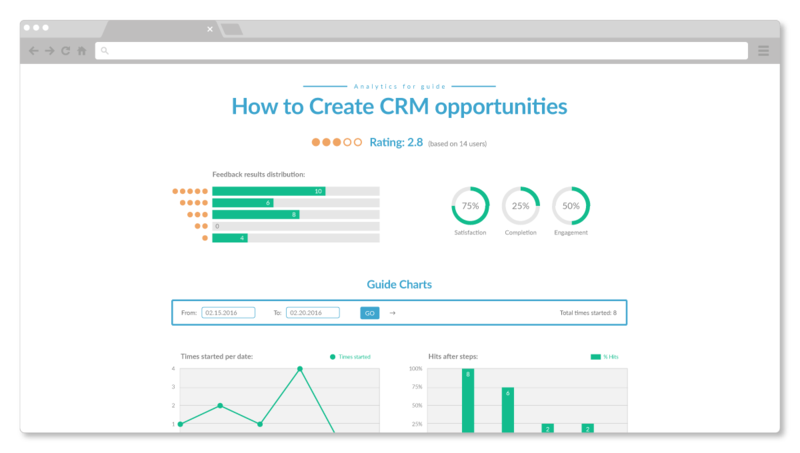 Iridize is a cloud-based and on-premise business process management solution that delivers customizable actions for user education. Managers can use Iridize to organize and monitor onboarding processes and employee resources. Dashboard and reporting capabilities offer user-friendly analysis of ongoing data. Create interactive guides, with embedded images, video, forms, GIFs, that act as a layer on top of any web-based software and guide customers and employees through successful product adoption. Team members can monitor user activity, analyzing which guides were seen by which users. Templates and customizable rules target user behavior and actions to ensure future guides offer a tailored approach. Track guide activation and collect user feedback to improve adoption rates and overall performance. Product and marketing managers can use Iridize to offer personalized onboarding with real-time communication to help increase user confidence and quicken product adoption. Training and education professionals use Iridize to create training programs that fit specific user needs. Track results and user engagement with the Iridize analytics engine. Product owners use Iridize to offer real time, customizable support, integrated with the product flow. Not sure if Iridize is right for you? Use our Product Selection Tool to compare other business process management solutions. Have questions? Call one of our unbiased Technology Advisors for a free consultation. Learn everything you need to know about Iridize. Our experts will reach out to you shortly.